Here are the Rewards Canada Top 5 Credit Card Sign Up offers for the month of September! This is not a 'best' credit card list like our Top Travel Rewards Credit Card rankings but instead a look at cards that have very good acquisition (sign up) offers. As always when choosing a card you should always take other factors into account other than the sign up bonus, but when most or all of these cards are first year free, they can and do pay off even when you grab them strictly for sign up rewards. In fact all of the cards on this list for September are first year free so you can try them out at no cost and decide later on if the card is right for you. All the while earning the sign up bonus which can be used to subsidize your travels! We lose out on two big offers that ended prior to the posting of this post. The 60K offer for Best Western Mastercard concluded on August 31 and then the big bad news of the Marriott Rewards Premier Visa card being discontinued means two slots opened up for this month. 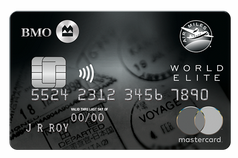 One was an obvious choice, the BMO AIR MILES World Elite Mastercard since it is first year free right now and we had a few options for the other but give it to the TD First Class Travel Visa Infinite Card since it now has a limited time sign up bonus and is also first year free.